The board member will meet with female engineers today to address their concerns. Some Uber employees are frustrated by board member Arianna Huffington’s role overseeing the ride-hail giant’s internal investigation into sexism allegations, citing her close relationship with CEO Travis Kalanick and recent comments to the media. Huffington, who joined Uber’s board last year, will on Friday afternoon meet with a group of female engineers who plan to raise concerns about whether she can lead an impartial review of the company’s workplace practices, particularly after remarks she made on CNN. 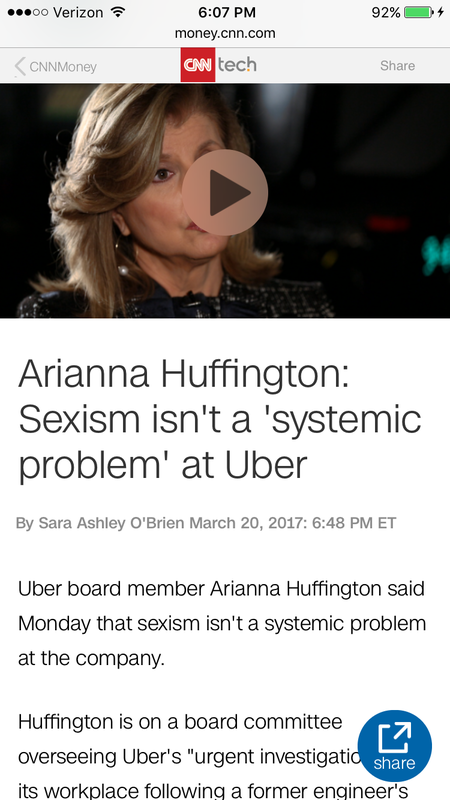 CNN posted an interview on Monday that quoted Huffington saying sexism was not a “systemic problem” at Uber. On a conference call with reporters on Tuesday, Huffington said she was referring to sexual harassment, rather than sexism broadly, and that CNN had updated its story accordingly. Still, the interview unnerved some Uber employees, who told BuzzFeed News they were already concerned about whether Huffington could help lead an independent investigation into Uber’s workplace culture, given her relationship to the company and friendship with Kalanick. “She’s on the board. She’s qualified. But she needs to be honest about her conflicts here,” another employee said. Referring to the interview with CNN, the employee said sexism and sexual harassment could be considered on “the same spectrum,” and also noted that it’s troubling she made comments while the investigation is ongoing. After Susan Fowler Rigetti published a viral blog post alleging systemic sexism at the ride-hail giant on Feb. 19, Uber hired former attorney general Eric Holder to lead an internal investigation into its workplace environment. Huffington was named to a board subcommittee that will receive and push to implement the results of the investigation, and has become a public face for Uber as it weathers this particular public relations crisis. She appeared alongside Kalanick at the company’s first all-hands meeting after the sexism allegations became public. On a call with reporters on Tuesday, Huffington said the investigation — which is being conducted with the help of Tammy Albarrán, a partner at Holder's law firm — will be “completely thorough, completely independent,” and presented to a board subcommittee she sits on. “I am not conducting the investigation,” she said. Earlier in the call, Huffington noted that she had spoken to “hundreds of employees either personally or on the phone” in recent weeks. Several Uber employees told BuzzFeed News that Kalanick’s handling of Uber’s recent scandals has shaken their confidence in him as a leader, noting that they’ve been frustrated by his apologies. “I’m extremely unhappy and disappointed in the leadership,” said one. Other employees raised an eyebrow over Huffington’s recent comments, noting that she has publicly described Kalanick as “a close friend” and recounted at an all-hands meeting held after allegations of sexism emerged a story about cooking the Uber CEO an omelet when she was considering joining the company’s board. “Glad she is taking precious care of the CEO while there is a serious disconnect going on,” one employee said of Huffington. 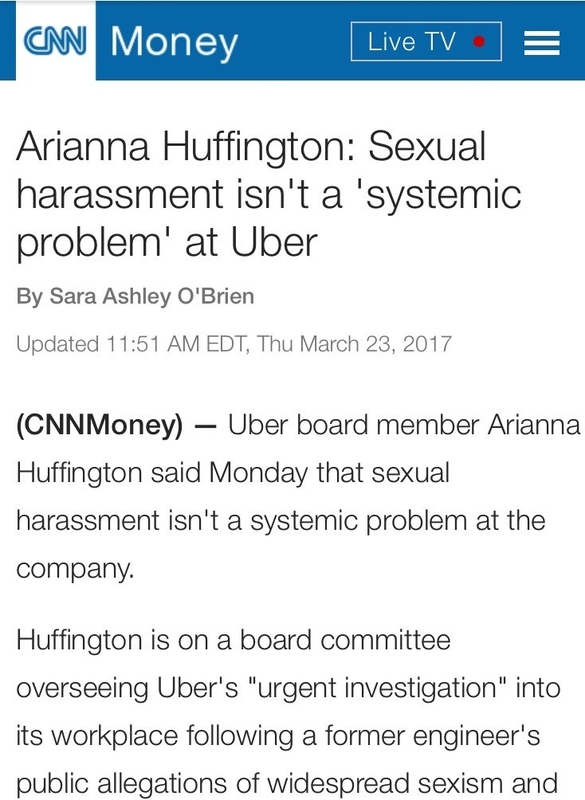 This isn’t the first time Uber employees have raised concerns about Huffington. In the winter of 2016, sources say, a T-shirt for Huffington’s Thrive Global health and wellness company with the slogan "#SLEEPYOURWAYTOTHETOP" sparked outrage among women at Uber, some of whom believed it was available only in women's sizes. A number of Uber employees, complained to Huffington and Uber senior vice president Ryan Graves. The shirt was ultimately removed from the Thrive website. Reached for comment, Thrive sent BuzzFeed News a screenshot indicating the company also sold the shirt in men’s sizes. If you have information or tips, you can contact this reporter over an encrypted chat service such as Signal, WhatsApp, or Telegram at 732-615-8367. You can also send an encrypted email to priya.anand@buzzfeed.com using the PGP key found here. Find our SecureDrop information here. Huffington told Uber employees that she prepared an omelet for Kalanick when she was considering joining the company’s board. A previous version of this post misstated the story behind the omelet.